If your brand has a social media presence, Twitter.com is generally the first place you will look at to find out what people are saying about you. You can monitor keywords using the search function and scan all tweets that contain the keywords you need. Twitter will allow you to save your searches and even embed the stream on a webpage. As you look through your search results, make sure you have selected “All” tweets to see all the results as the default setting will only show the top tweets. 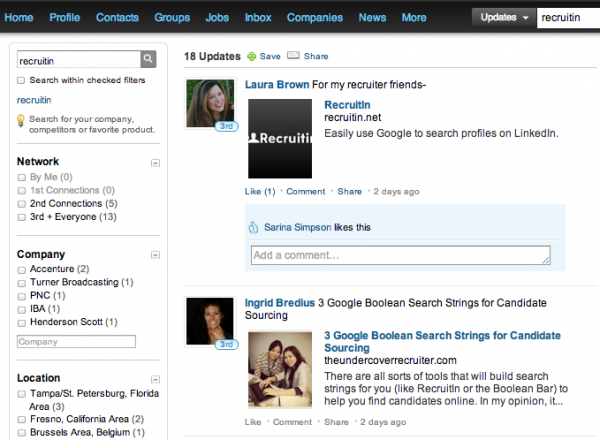 Using LinkedIn Signal, you can search all user updates for mentions of your brand or keywords. From the search bar, all you need to do is select “Updates” from the dropdown menu and you’re on your way. As with other sites, LinkedIn will allow you to saved your search for future use as well as applying filters to narrow down your results. The results will also show you if anyone within an individuals’s network has liked or shared an update about you. This is especially useful information as you can use this to generate leads and establish connections with individuals who have already bought into you brand. Within the results you can also see if people have shared a story about you within a particular LinkedIn group that you may not have known about. In most cases, you can easily access the group and the specific discussion around your brand. Depending on the nature of the group you should try to join it and establish a direct connection with your users who can provide more feedback and insight. Topsy is a free tool that offers social insight. By searching for your brand keyword or domain, Topsy will show you status updates or tweets that mention you or link to your domain from different online sources. You can then set up an email alert or RSS feed subscribing to the latest search results. Alternatively, you can also use Topsy to monitor how many people are tweeting about your company’s blogposts or domain and group them accordingly for ease of use. From the screenshot below, you can see that the most recent tweet containing “http://recruitin.net” was from 2 days ago and that to date, the link has been shared on the network 224 times. Topsy will also highlight individuals who are “influential” within the network. 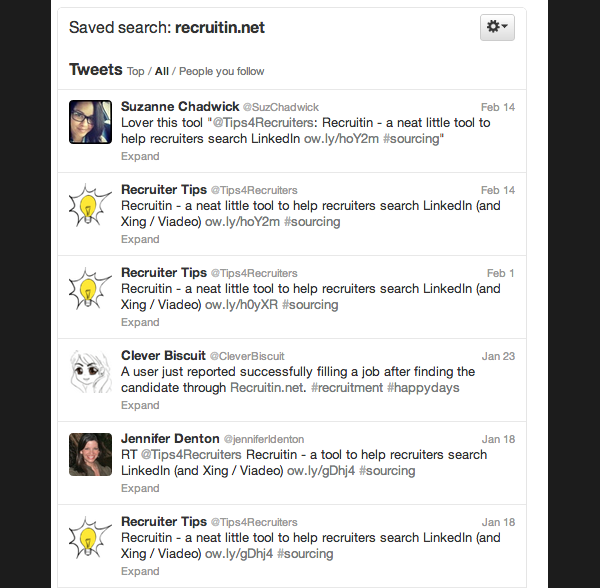 For Recruitin, people generally share the link to the tool within their network as opposed to simply mentioning the name in passing. If people are purposely sharing your website, you can simply go into your Google Analytics account and from the list of referring sources, find out where people are sharing your web address. If you don’t have access to your domain’s Google Analytics account you can use Open Site Explorer to check what sites are linking to your company domain. You can search up to 3 domains per day for free and by filtering the results for inbound links to you root domain, you will see how many sites are linking to you. You can then simply follow the links to find out what they are being used for and consequently, what they are saying about you. This is just a broad overview of tools available to monitor your brand’s online presence. Generally, each social network or forum will allow you to search within the site for occurrences of your keyword or brand name. It’s up to you to decide how relevant this is to your strategy and whether there is any value in following the conversations within smaller networks. Remember that social media monitoring is just that, monitoring online conversations. The primary goal is to gather insight about how people perceive your brand or utilise your services. Unless there is an intrinsic value in joining a conversation that you did not facilitate yourself, it is probably best not to jump in aggressively. Respond according to the nature of the conversation. After all, it only takes one knee-jerk response to an unfavourable comment or an unflattering blogpost to unravel your entire social media strategy and plunge you into a media disaster. By regularly checking in on the onine conversations around your brand, it would make it easier to avoid a media disaster as well as making sure that your brand is truly engaged beyond just maintaining a set of social media profiles.